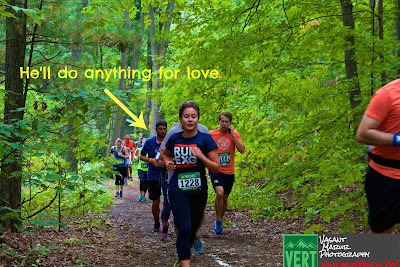 I made my loved ones run in the woods early on a Sunday morning to celebrate my thirtieth birthday. My three incredible running buddies, my up-for-any-challenge cousin, and my run-loathing but wonderfully supportive husband all got out of bed at the crack of dawn, without complaint, to run 7-mile and 3-mile trail races in the Middlesex Fells Reservation because that's what I demanded for my birthday party. I compensated them with vegetable tattoos. The Middlesex Fells Trail Running Festival, otherwise known as "Fellsfest", is part of the VERT race series started by Cambridge 5K. 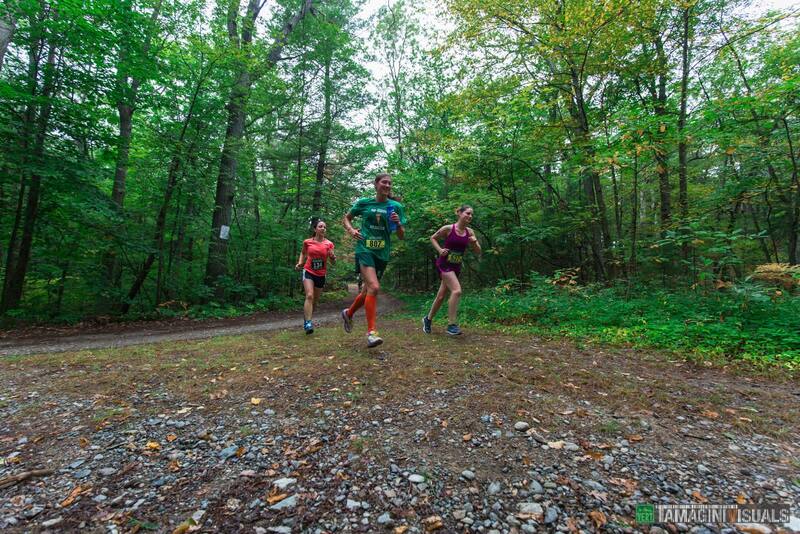 Races in this series take place in city parks you can get to from Boston by public transportation. 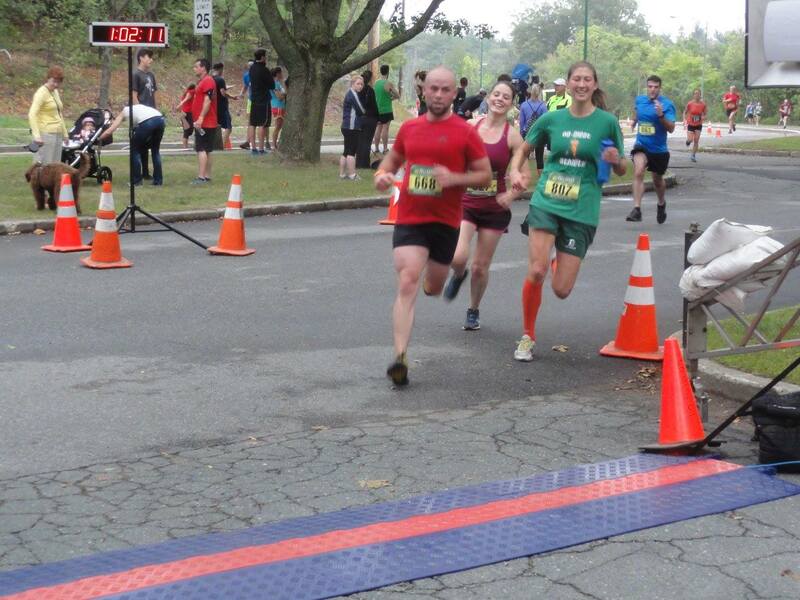 As with every race put on by Cambridge 5K, it was impeccably coordinated and totally fun. 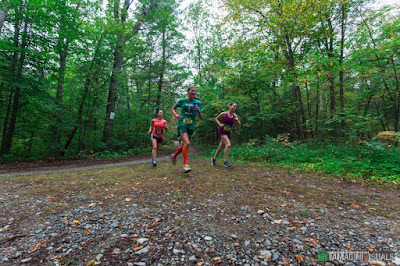 The festival benefited Friends of the Fells and the Stoneham Senior Center and included a 7-mile trail race followed by a 3-mile trail race through the Fells, with the option to run both races back-to-back. Chris and I hit the road at 6:45 am to pick up our companions and drive to the Stone Zoo. We arrived early and parking was no sweat. We queued for the port-a-potties and watched in horror/mild amusement as a young woman emerged shrieking and holding her iPhone gingerly with a plastic bag, having just retrieved it from the dark depths of a port-a-potty. I hope Apple Care Plan covers accidents involving human feces. The 7-mile race was first. Ciara, Becca and I squeezed ourselves into the crowd forming at the start line. It was gray and just chilly enough to be good racing weather. As I've come to expect with Cambridge 5K's races, the gun went off promptly at 8:00 am and we took off out of the parking area. 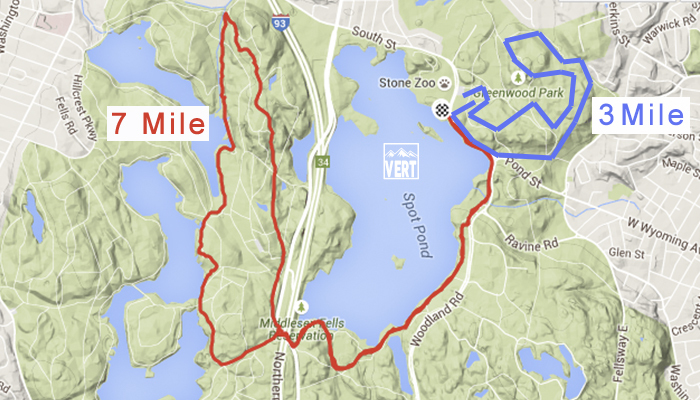 After a quick stretch running south on Pond Street and Woodland Road, the course turned right and entered a trail along the perimeter of Spot Pond. Despite it being early September, yellow leaves already littered the trail and made the whole experience feel decidedly autumnal. There were no mile markers on this course, so I was glad that my Garmin watch was working well. We crossed Route 28, which was temporarily closed off for the race. I was pleasantly surprised to encounter a water station on the roadway, since I'd been under the impression there wouldn't be any water on-course. I skipped it on the first pass knowing we'd run by again on our way back to the Zoo. We re-entered the woods and the rocky path took a fairly steep climb up to the skyline trail. I decided to sustain hard effort here on the climb, but regretted not researching the route a little ahead of the race. I wasn't sure whether I should be saving energy for hills ahead of me. Fortunately, my gamble paid off. There were a few small rolling hills and some rocky downhill sections, but no significant climbs the rest of the way. 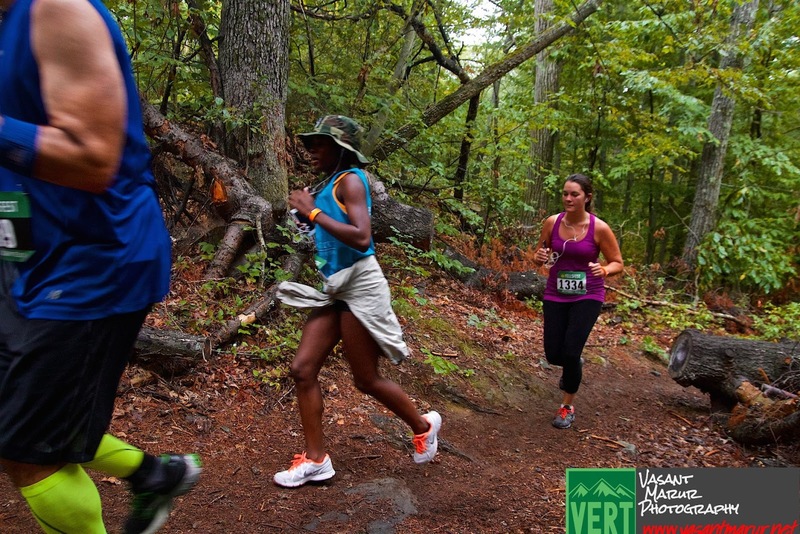 I haven't run on hilly trails much, and was interested to see how runners' approaches to the terrain varied. I leapfrogged with a few folks who tended to bomb on the downhills and then slow significantly on the straightaways. 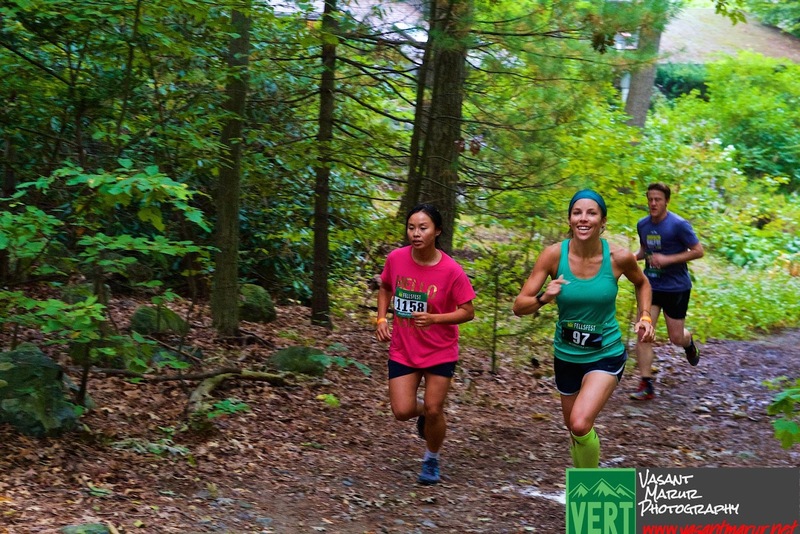 Some of the downhill stretches were narrow enough that we had to run single file, and I took care to maintain my footing while careening downward, half in control. Passing one another took more strategy and alertness than I've grown accustomed to in road races on wide, open pavement. 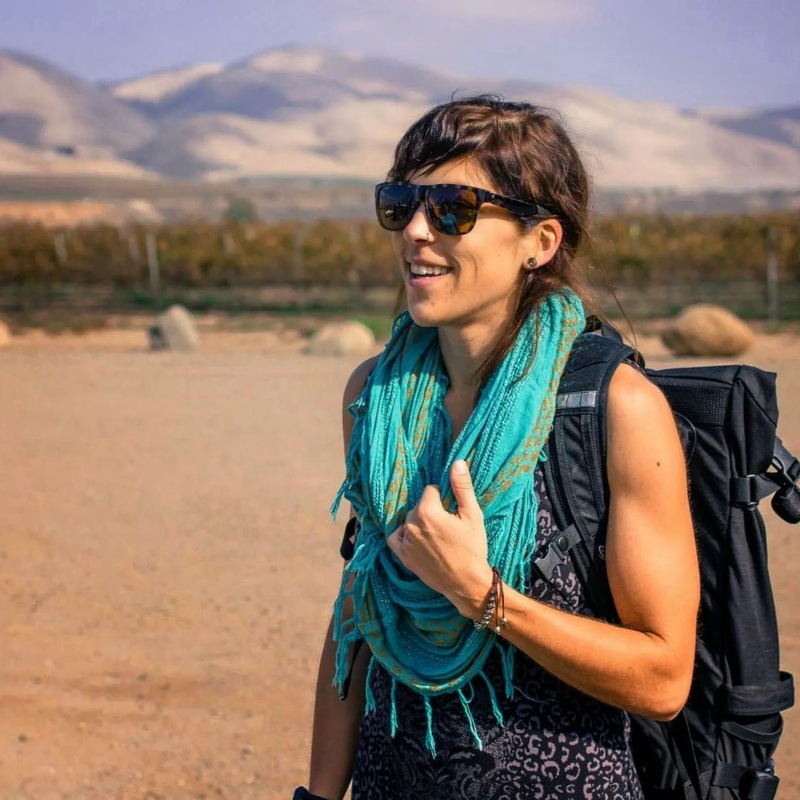 I focused on maintaining a relatively steady, moderately challenging pace. And kept reminding myself to look up and take in the nature now and again. 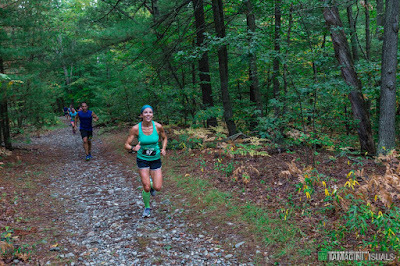 After some flatter, wooded running, we made a sharp turnaround and loped south along North Reservoir and Middle Reservoir before crossing back over Route 28. This time I took a cup of water and poured half of it up my nose. I am out of practice with the Hold-Pinch-Sip method. The next stretch of the race was patrolled by a race crew member on a bike, who was providing both physical and moral support. I really appreciated his friendly, "You're looking strong, keep it up!" It misted rain, which felt pretty awesome. 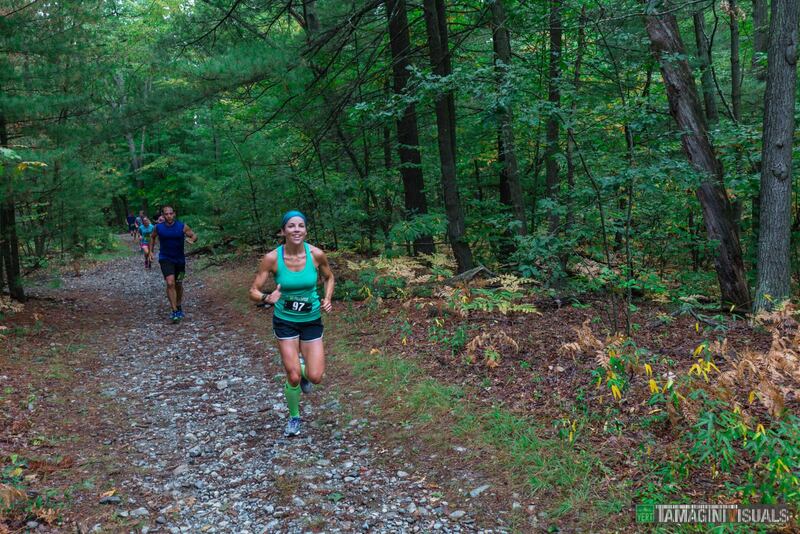 I was impressed by the intricate, expansive network of trails in the Fells and would imagine that navigating a trail run on my own might be a serious challenge. Just look at how intense this map is. 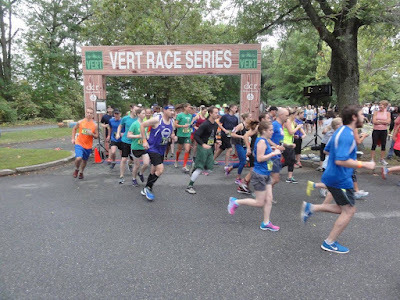 The course was well marked with green "VERT" signs and there were course marshals stationed at several potentially confusing intersections to make sure runners stayed on course. Despite loving the challenge of the trail terrain, I was secretly thrilled when we turned back onto pavement for the final stretch to the finish. I felt like I could really let my legs out here without worrying about misplacing a step. As per usual, Becca and Ciara sprinted the finish together. The 3-mile race started across the street in Greenwood Park at 9:30, so I had just over a half hour after finishing the first race to get cold and tight. 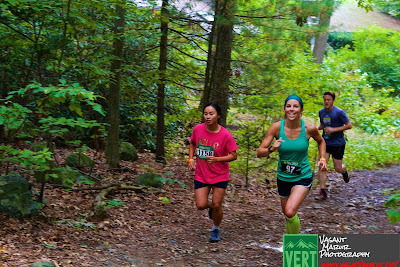 Chris, Steph, and Nica ran this race with me while Ciara and Becca cheered us on. 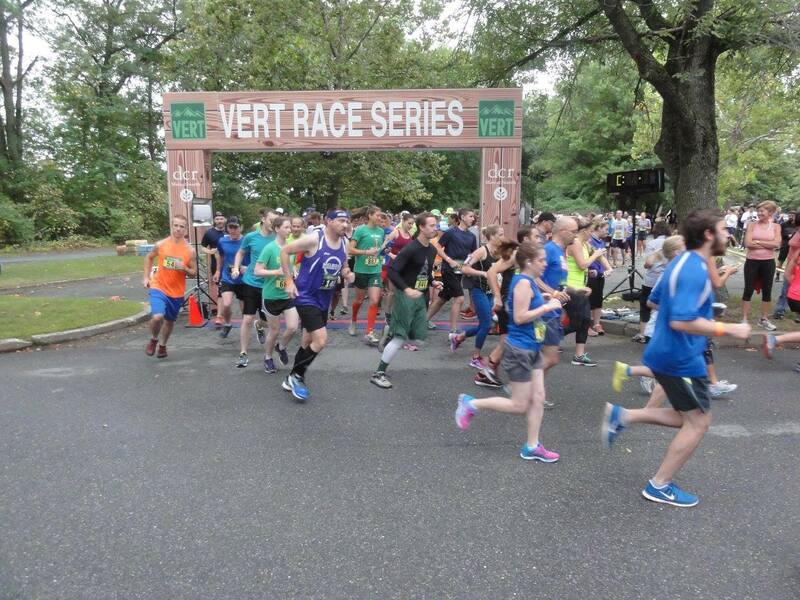 The 3-mile race began in the park and turned down the same stretch of Pond Street as the 7-miler. This time, we made a left turn into trails on the northeast corner of the park and came upon a short, steep, rocky incline. This turned out to be the only incline of the race. My legs felt a little heavy after the half hour break between races. 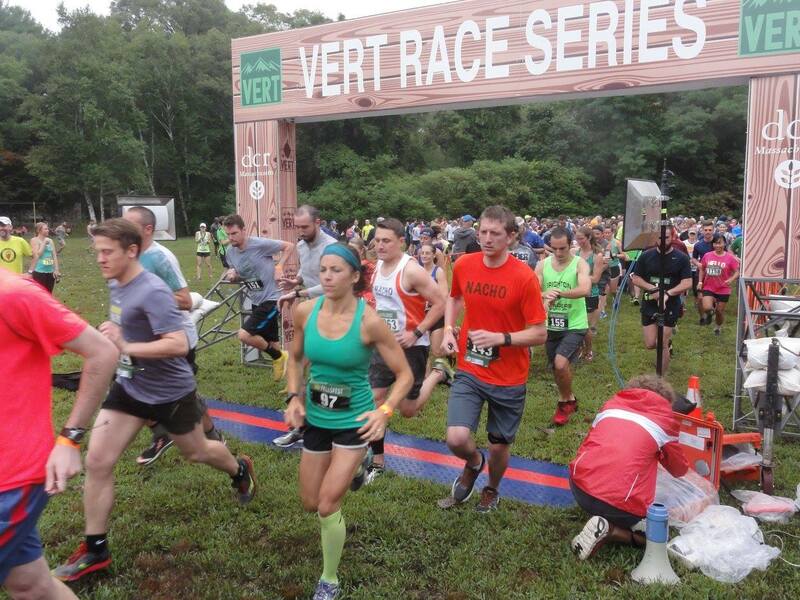 The biggest challenge of this race was trying to maintain speed without face planting on a root or careening down a hill. The more crowded, narrow sections of the trail made this especially tricky. 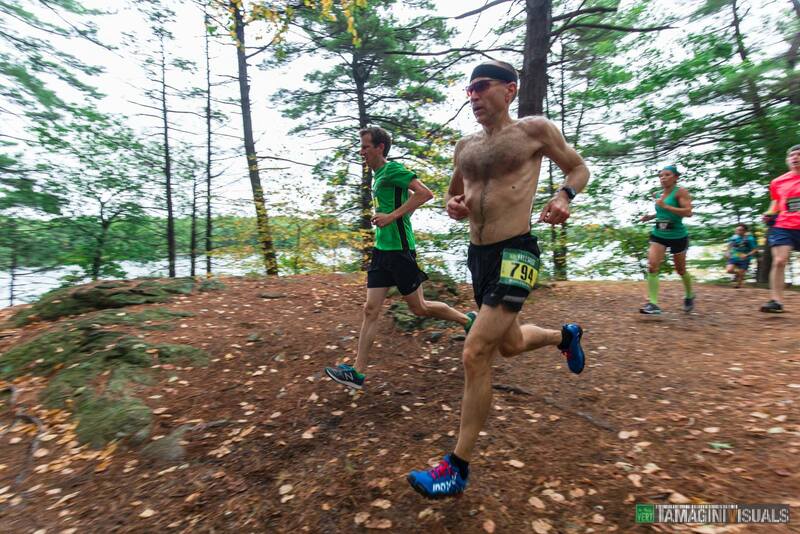 The final quarter mile of the race was a steep downhill. I felt exhilarated by the controlled chaos. 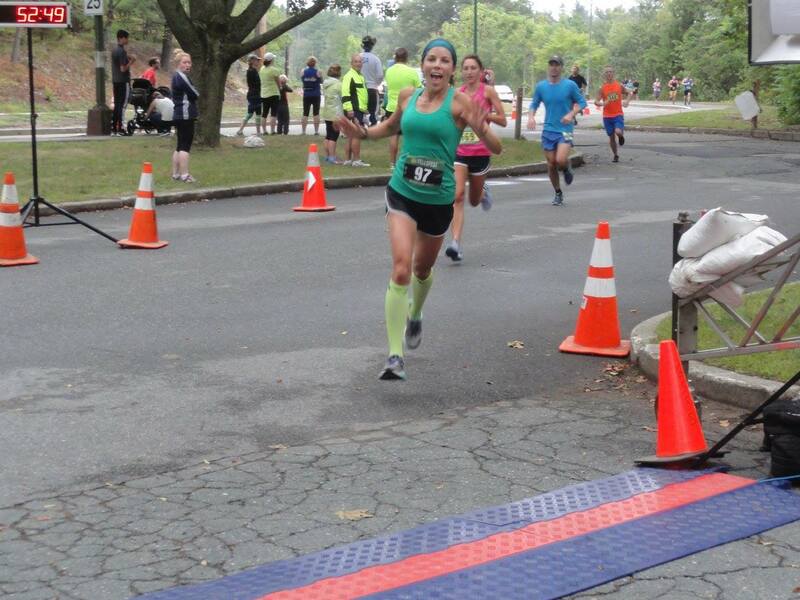 The post-race DJ shouted encouraging remarks and windmilled his arms to wave us down the hill toward the finish line. I pumped my arms and legs, attempting to catch the man in front of me, but I couldn't quite overtake him. Each of my companions finished the race strong and we posed for a group photo at the finish line before heading to the post-race festivities, which took place at the entrance to the Stone Zoo. Plentiful beer from Notch and Slumbrew (and cider from Downeast Cider) awaited us, but the sandwiches ran out quickly. So Chris drank a lot of beers, because, hey, he ran three miles. Steph supplied our post-race party favors including a very excellent birthday hat. 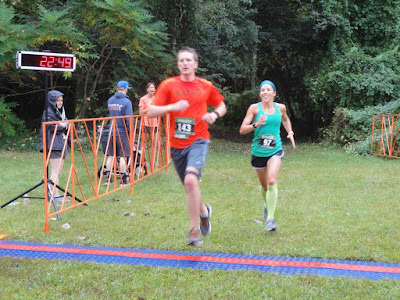 I ended the day with a 1:15:39 net time for the combined 7+3 mile race, making me the 5th place woman and the 20th overall finisher. This was my first experience running in the Middlesex Fells Reservation. I'm in awe that such a beautiful, serene and expansive oasis exists amid the most densely populated municipality in New England. I might be hooked on trail running. Let's hope I can manage to keep my footing and avoid getting lost in the trails!